The hamlet of Sajac, located in South Aveyron along the river Tarn, at the end of the paved road, can accommodate groups of hikers or groups of holidaymakers from 14 to 27 people in June and September for stays of 5 or 7 days with departure from the hamlet on Saturday around 10 am and the months of July and August for stays of 7 days with departure on Saturday morning, the four cottages can also be rented separately from June to September. 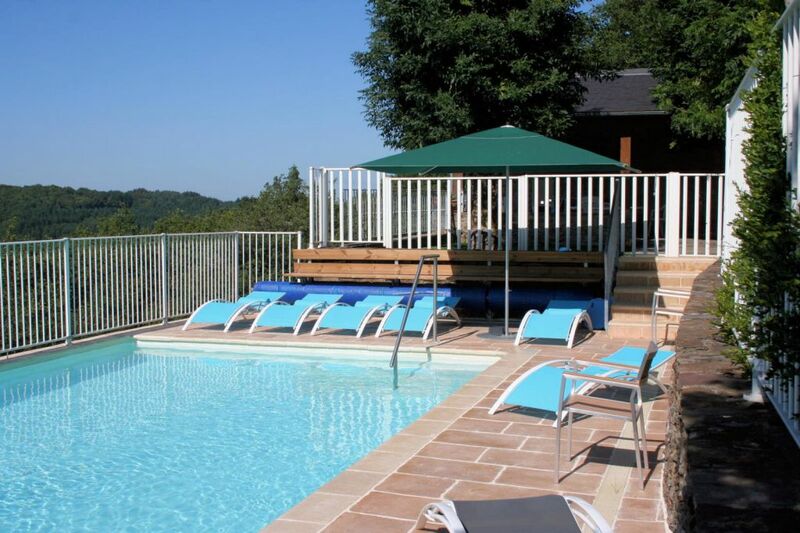 The detailed description, many photos (including the interior of the cottages), reviews and guest reviews of 4 lodgings, labeled 2 ears and 2 stars, are available on the site Gites de France Aveyron: click on the box lodgings and then type Montclar in the box where? then click on the search box then you have the four cottages of Sajac 12550 Montclar; the reservation can be made by the owner. The 4 cottages: La Grande Maison (sleeps 14), Le Grenier (sleeps 6), La Callune (sleeps 5), La Grange (sleeps 2) are independent and located in different buildings in the hamlet (see last photo), free WiFi is accessible from 4 gites. The daily cost in June and September for one person is of the order of 8 to 10 € / day depending on the number of lodgings rented and the filling rate of these deposits; these cottages can also be rented separately from June to September. A caterer Eric Bride, located in Brasc at 5 km from the site, can deliver complete meals or a main course, The caterer the Restaurant l'Oasis in Réquista (13 km) can provide complete meals or a main course and is located near of a large surface. The activities: swimming pool (10 m by 5 m, depth 1.30 m on the whole surface), petanque, ping-pong and initiation swin golf can be realized in the hamlet; the following facilities are common to the four gites and the owner living in the hamlet during the rental period: the swimming pool, a 600 m² fenced playground with petanque, a 70 m² panoramic terrace overlooking the Tarn valley (view panoramic on the opposite side of the Tarn from 10 to 12 km), a games room of 80 m² and a pitch Swin-golf pitch located 100 meters east of the hamlet. The evenings and nights are very pleasant because of the rise of a little cool river Le Tarn flowing below the hamlet (elevation of 300 m) at a distance of 800 m.
Heated pool (solar heating and heat pump if necessary) with very comfortable water treatment: sterilization external circulation water by passage in a UV tube and additional treatment in the pool with residual oxygen, the pool is accessible to holidaymakers from Monday to Friday from 10h to 12h30 and from 15h to 19h. Hiking trails near Sajac are numerous and varied in the Tarn Valley; 2 hiking booklets. In Pays du Réquistanais and Pays de Roquefort are present in each gite. If necessary, I can give information by internet or mobile phone in the evening between 19h and 20h. I live in Sajac during the rental period of the cottages.